I woke up this morning feeling a bit frazzled and stressed. So much left to teach in my class! So much left to write on my book! I'm going to be away next weekend from Thursday to Sunday for dizzyingly wonderful opportunities to reconnect with many dear friends, but can I really afford four days of pure play? And in between now and then I have class, student meetings, a Tuesday outing with a beloved friend who teaches children's literature at Virginia Tech in nearby Blacksburg, talks by author Candace Fleming and author/scholar Lisa Rowe Fraustino, and more, more, more! Plus, I weighed an additional half pound this morning, despite walking for almost two hours every single day. My walking partners and I have designated Sunday as do-your-own-walk (or not) day; we don't make plans to head out together precisely at 6:15 a.m., on the theory that an unscheduled day of rest is all to the good. I didn't feel like walking. Why walk, if I'm gaining weight, anyway? I didn't feel like writing. Why write, if I can't get everything done, anyway? Why not stay in bed a little longer itemizing in my head all the things I feel stressed about? But I got up and threw on my walking clothes and headed out the door at 6:30, the fifteen-minutes-later-start, my concession to the day. As I walked alone, grumpy, crabby, and mopey, I saw a student from my chapter book class out running, who had slowed to a walk. We fell into step together and started talking. She's not only earning an M.F.A. degree in writing during summers at Hollins, she's also earning a Ph.D. in media/communication during the academic year. In fact, she was one of the presenters at my Ethics and Children's Literature conference at DePauw two years ago. We started talking about her dissertation, which is focused on children and consumer culture, with a chapter on American Girl dolls. I told her about my doll Kirsten, and how my grad students took my hint that they might chip in to buy her for me in celebration of my receiving tenure. I told her about the paper I had heard about the American Girl doll books at ChLA this year, on whether the earlier books had been more "radical" than more recent ones, if "radical" and "American Girl dolls" can be used together in the same sentence. She told me about the ethnographic study she had done of the customers at an American Girl doll store in St. Louis. Then we turned to her chapter book-in-progress, as we reached the crest of the hill and looked out at the farmlands stretching before us. She had switched ideas from the synopsis she had shared last week and has a whole new project. We brainstormed some structural features about it as we walked on. I offered an excellent idea for what the inciting incident for her character's story could be. She thought it was an excellent idea, too. And if not, at least I raised some suggestive possibilities that might stir something productive in her own thinking. It was one of those conversations that left me thinking, "THIS is what teaching is. THIS is why I want to leave my sweet life in Boulder for six whole weeks on the other side of the country. Just for THIS: to talk deeply and richly about what I love best with someone else who loves it best, too." And when I got back to my little apartment, my (admittedly unreliable) scale weighed me half a pound lighter. So there! I like to collect "perfect days" - days that are complete and wonderful, often in a quiet, ordinary way, sweet, beautiful days, unremarkable days that nonetheless deserve to be remarked upon. I'm having quite a few perfect days in my Hollins summer. Here are two. Thursday, my formal teaching duties for the week had been satisfyingly discharged: my students' chapter-books-in-progress are looking so good! So four days "just for me" stretched ahead. I started the day, as I start every day here, taking a long walk (from 6:15 to 8 a.m.) with two of my fellow faculty, Elizabeth Dulemba and Candice Ransom. They are both so much better than I am at noticing nature: muskrats and heron in Tinker Creek (yes, Annie Dillard's Tinker Creek), a cardinal perched in scarlet splendor on top of a street sign. Elizabeth stops to say hello to the horses pastured along the way, greeting each one by name. "Good morning, Oyster!" They nuzzle against her petting hand. Back "home" in my little apartment, I wrote for a good hour on my chapter book-in-progress, the fourth title in my Franklin School Friends series, this time a spelling bee story starring know-it-all Simon. I'm at the point in the writing where I have that delicious momentum that makes it feel as if the story is writing itself. At 10:00 my dear friend Rachel came to collect me. Up first: picking up a few things she needed at Target! I do love tagging along on other people's errands. I've loved it all my life, since I spent much of my high school years going with my dear friend Betsy to pick up dry cleaning, get her shoes resoled, and visit her Aunt Peggy. There is something so relaxing about living someone else's life for a little bit. Then we drove up Mill Mountain and saw the world's largest steel star (so they say; I'm always a bit skeptical about such claims - has EVERY single star in the ENTIRE WORLD really been measured and compared?). As storm clouds gathered, we went to the Grandin neighborhood, near Rachel's house, and got completely and thoroughly soaked to the skin as we dashed into Cups, the perfect cafe for writing. Rachel actually got more soaked than I did, so much so that we had to call her husband, John, for dry clothes. Note that this does nothing to compromise the perfection of the day. At Cups we both had "steamers," my new favorite thing: warm milk flavored and sweetened with Italian soda syrup. Rachel had a pumpkin pie steamer; mine was a mixture of chocolate and cherry, like drinking foamy chocolate-covered cherries. Dry and warm now, we stopped into Too Many Books (can there be such a thing? ), where I bought myself a used copy of Lucy Maud Montgomery's journals, volume 1. 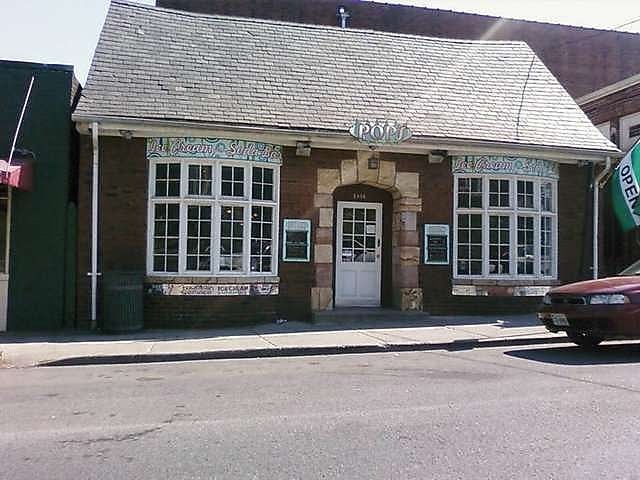 Then we saw a movie, the lush and romantic period-drama-with-a-social conscience, Belle, at the historic Grandin theater. Cobb salads at a local eatery converted from an old ice house completed our outing. Yesterday was as perfect, if quieter. Another early walk, on a cool, crisp, and exhilarating morning, the world scrubbed clean from the previous day's downpour. I wrote in my little apartment all morning: chapter 8 of Simon's book. Then I wandered over to campus mid-day to meet with two students to talk about their chapter books, chatting with one in the gorgeous Hollins library, and the other in the cozy lounge on the third floor of Swanannoah Hall, which I had just discovered. 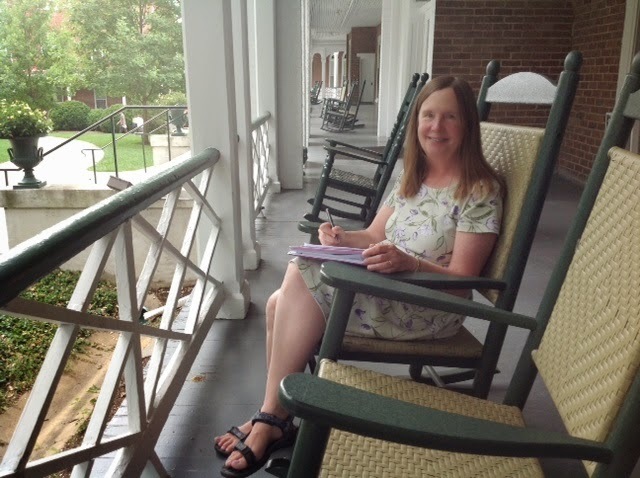 After that, I sat on a rocking chair on the verandah of a Georgian-style building on the quiet Hollins quad and scribbled my way through Simon, chapter 9. In the evening: 4th of July barbecue at our director Amanda's fabulously whimsical Victorian home with backyard fireworks (legal here, unlike Colorado). Today so far I've had my walk. My colleague/neighbor Ashley and her dog, Tula, met us along the way. Shortly I'm heading to another colleague/neighbor's Birthday Bubble Brunch for her two super-bright, super-cute daughters. Then more writing: Simon, chapter 10. Should I write here at home? Or at the library (where BLANKETS are provided for extra coziness?). Or on the verandah again? At 3:00, I'm heading out for ice cream with a student who has a car and offered to take me. Planned topic of conversation: writing! I have a feeling I'm heading for three perfect days in a row.